Just a fun card for a friend and thought I would follow the guidelines for the Newton's Nook Designs Inky Paws Card Challenge #44 and add one more card. 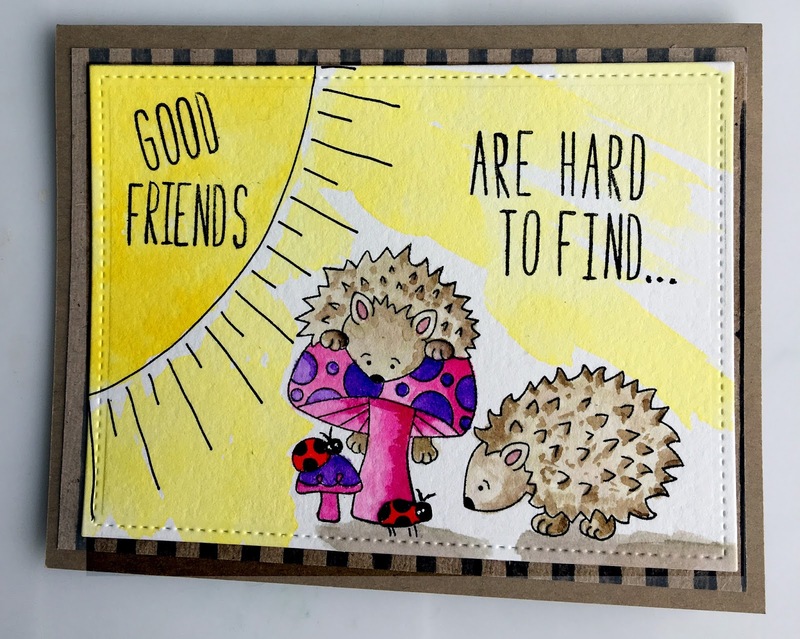 When I created this A2 card, I knew I wanted a special sentiment that I didn't own, so I put it together with some alphabet stamps. This set is the Hedgehog Hollow, which I think is just too cute and I had to use it right away. I just drew in the sun to pull in the yellow that was part of the challenge and then used Distress Ink to paint in the pink and purple mushrooms- with pink and purple being part of the challenge as well. I did some quick watercoloring for the sun and the little hedgehogs and ladybugs. I found some black striped kraft paper and layered that between the card panel and the kraft card base. This was really just fun to do- thank you for stopping by! Too cute! Love the bright sunshine! Thanks so much for sharing at Inky Paws Challenge! This is adorable! I love the big sun beams you added in! Those hedgehogs are so cute sitting in the sun! Thanks for playing along with our Inky Paws Challenge!